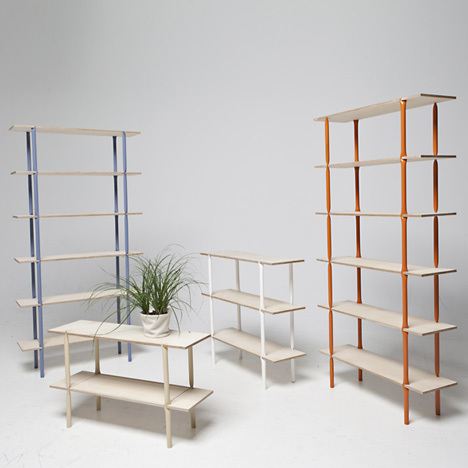 Steel tubes are pinched together at intervals then slotted into corresponding grooves in plywood planks to create this shelving system by graduate designer Arttu Kuisma. The In a Pinch system comes flat-packed and is erected without screws or fixings simply by slotting a pole into the shelves at each corner. A cabinet can be created by slotting aluminium panels into grooves in the surface of the plywood. "The project has been a material-driven search of simplicity and functionality," says Kuisma. "In A Pinch is based on a single structural detail that determines how the shelf is manufactured, assembled and what it looks like." "It's easy to assemble and solid enough to carry around without taking it apart." Kuisma had the idae while studying at Lahti University of Applied Sciences. See his seating project made from rolled-up carper in our earlier story. Photos are by Timo Laaksonen.